Legal Pluralism in Conflict offers a new theoretical perspective for conceptualising and analysing the relationship between ethnic minority laws and the official legal order. Examining the limits of liberal legal thought in light of a contemporary plurality of ethnic identifications and religious beliefs, Prakash Shah takes up the case for a 'legal pluralism' that views ethnic minority laws in interaction with the official British legal order. This form of legal pluralism is not, however, without conflict. This book pursues a series of case studies that critically consider why and how state laws marginalise ethnic minority legal orders. 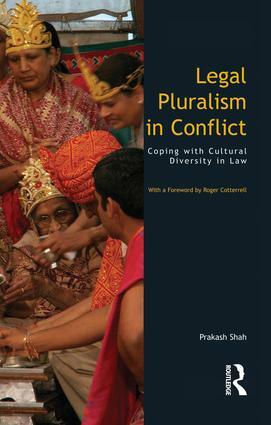 Legal Pluralism in Conflict contains discussions of the recognition of polygamous marriages, homicide, the expertise provided in immigration cases and the legal discourse of nationality. It is in this engagement with some of the most challenging issues posed by the diverse character of modern society that its author sets out an alternative course for ethnic minority legal studies. Legal Pluralism in Conflict will be invaluable to students and researchers concerned with law's relationship to and treatment of ethnic and religious diversity, as well as to those with wider interests in the limits and possibilities of political pluralism.